Malvern is a suburb in Melbourne, Victoria, Australia. It is located 8 km south-east from Melbourne's central business district. The Local Government Area is the City of Stonnington. 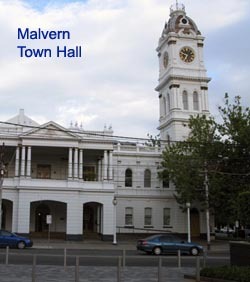 At the 2006 Census, Malvern had a population of 9,422. The area of Malvern was first settled in 1835. John Gardiner was one of its first settlers when he overlanded 400 head of cattle to found a settlement. When the first migrants came in the area in the 1850s they put up tents around the spring, which lay at the foot of the Malvern Hill. As a result a canvas town sprung up. A small hamlet known as "Gardiners Creek" was established by 1851 but it declined with the gold rush. The nearby creek was also named Gardiners Creek. Gardiners Creek Road (now Toorak Road) ran from South Yarra, east to the junction of Gardiners Creek and onto the Gardiner Homestead which is now the site of Scotch College. In the 1860s the Gardiners Creek Roads Board was the forerunner of the Gardiners Creek Shire that then became Malvern Council. At this time more formal water supply systems were under consideration, using the spring water. In addition wells were dug to enhance the availability of good water. Many of the cottages had galvanised tanks and underground reservoirs to store water which was a valuable commodity. Malvern Post Office opened on 1 January 1860 on Glenferrie Road near Malvern Road. In 1892 this was renamed Malvern North, when a new Malvern office on Glenferrie Road near Wattletree Road replaced the Malvern Railway Station office. The then shire hall (later town hall) was built in 1886 on the corner of Glenferrie Road and High Street and later extended. Prahran and Malvern Tramways Trust ran their first car out of Malvern depot on 30 May 1910. 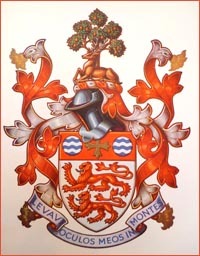 Like Malvern England the township was founded on spring water. The area around the spring was designated a water reservation since 1856. The natural spring, used by the Wurundjeri people prior to European settlement, supplied the developing suburb with water before a formal water supply scheme was implemented in 1869. In 1885 the government intended auctioning the land, but a public protest caused it to be secured for public use. The public reserve, which included 8 acres of land, was thereafter secured for the community of Malvern, leading to the formal development as the park. Malvern Gardens in Spring Road, were Malvern's first public gardens as well as the site of the historic spring that led to the establishment of Malvern in the nineteenth century. The official opening by Duncan Gillies M.P. took place on December 12,1890. In 1888 Malvern Shire Council approached Thomas Pockett, a gardener of some note, to 'prepare a plan of a sandy barren waste with a view of converting it into a municipal garden'. Pockett had previously won the first prize of three guineas offered by the Horticultural Society of Victoria for his garden designs elsewhere. 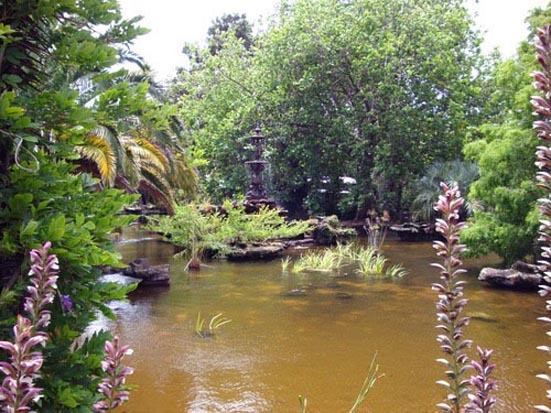 Pockett was appointed curator of Malvern Gardens and from 1888, over a period of twenty years, he landscaped the area. 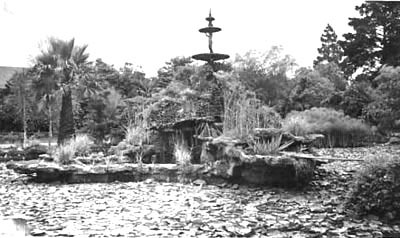 Pockett's original design included a fish pond where the handsome fountain was installed above artistic grotto work designed by Robinette. The picture at the top of this page was taken about 1940. The fountain disappeared sometime after the photo was taken, likely due to removal following disrepair. A perfect copy was made in 1992 and now stands in its place. The picture above is of the modern day fountain. 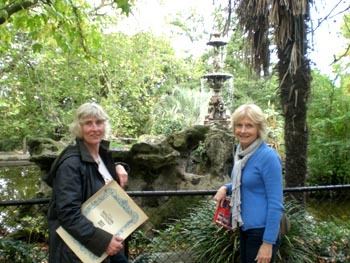 left - Di Foster poses with Cora at the fountain in 2013. 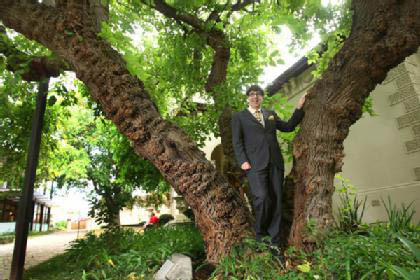 Di masterminded the Mulberry Tree project in Malvern Australia. In 1936 George Bernard Shaw planted a Mulberry Tree in Malvern, England to celebrate his 80th birthday. It blew down in a storm in the year 2000 and was lost. Fortuitously a cutting from this tree was sent to Malvern, Australia in 1959 which had flourished. Following the loss of the Malvern, England tree, a project was launched by the Friends of Malvern Springs and Wells to reinstate the English tree with a cutting from the Australian tree. Six cuttings arrived in England in 2009 and were subsequently planted, the best being unveiled in Priory Park, Malvern, England in 2016. For more details of the Two Malverns and a Mulberry Tree project click website below. The picture above shows the mayor of Malvern Australia, Claude Ullin in the Australian tree at the time the cuttings were taken for rearing and shipping to England.